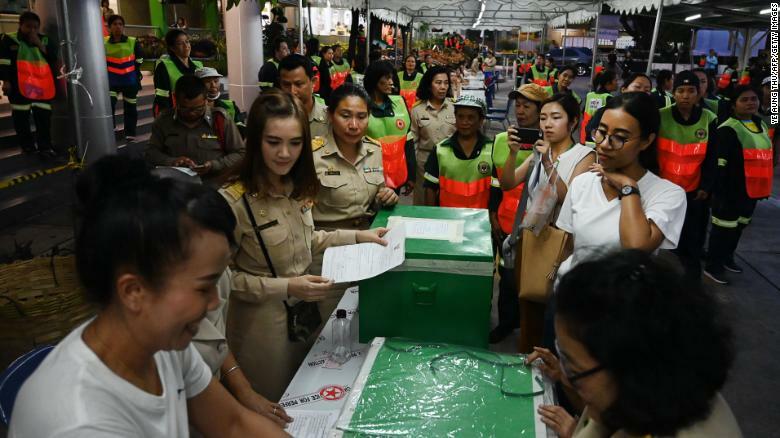 The outcome of Thailand’s first post-coup elections was still unclear Monday with no party taking a decisive lead, amid mounting concerns over alleged voting irregularities and ongoing delays in the release of official results. The elections are the first since the military took power in a coup in 2014, and are widely considered to be a contest between the pro-military bloc that wants junta leader Prayut Chan-o-cha to remain in power and pro-democracy forces fighting to restore democracy to the country. On Monday it appeared the pro-military party Palang Pracharat was neck and neck with the main opposition Pheu Thai Party, which is aligned with ousted former Prime Minister Thaksin Shinawatra. With 95% of the vote counted, Pheu Thai won 137 out of 350 seats, the Election Commission said Monday. The pro-military party Palang Pracharat took 97 seats. Parties are still waiting to hear how many party list lawmakers they will get — 150 are up for grabs in the lower house and they could prove decisive in who wins a majority. It was enough for Thaksin-aligned Pheu Thai to announce that they would form a coalition government with any third party that does not support the return of the military. “We have been chosen to come in number one (in constituency lawmakers) therefore we will start to form a government as we have received consensus from people,” Suradat Keyurapan, a prime ministerial candidate for Pheu Thai said Monday. Thaksin, or leaders connected to him, have previously won every election since 2001. Pheu Thai may be premature, however, as they will need to gain 376 seats to form an outright majority. It is unclear if they can muster enough support to achieve that with a legislature critics say is tipped in favor of the military. On Sunday, Palang Pracharat inched ahead in the popular vote with 7.69 million votes, while Pheu Thai Party received 7.2 million votes. The decision of the EC to delay and then drip feed the results has prompted criticism from many observers. On Monday, Thais voiced their frustrations with the hashtags #PoTaek — which loosely translates to “careless cheats are easily discovered” — and #KongLuangTang — “cheating elections” — trending on Thai Twitter. The polls were the first since the military took power in a coup in 2014 and were embraced by many, especially younger voters, as a chance to restore democracy to Thailand after five years of military rule. The Election Commission put the turnout rate at about 66% of the nearly 52 million voters — much lower than expected. It is likely that no party will win a clear majority in the 500-seat lower house and parties are expected to begin power-broking to form a coalition. But the cards are stacked in Palang Pracharat’s favor. Critics have said new electoral rules are designed to disadvantage big parties like Thaksin’s Pheu Thai and keep the military in power. The 250-seat member Senate is likely to play a key role in deciding the next government of Thailand and, because it is chosen entirely by the military, it will likely vote in line with Palang Pracharat. It could take more than a month before Thailand’s next prime minister is known as the Election Commission has until May 9 to announce the official results. If Palang Pracharat secure their coalition, it’s likely their only nominated candidate, coup leader turned prime minister Prayut will return to power for four more years. People watch the vote counting process at a polling station in Bangkok on March 24, 2019 after polls closed in Thailand’s general election. One of the stars of Sunday’s election was the newly-formed Future Forward Party, which received 5.3 million votes at the last count — putting it on track to become Thailand’s third biggest party. FFP had become immensely popular with many of the country’s 7 million first time voters through its comparatively progressive policies, savvy social media campaigning and billionaire leader Thanathorn Juangroongruangkit. Presenting itself as one of the anti-junta parties, FFP’s campaign included pledges to change the military-drafted constitution, cut the defense budget, increase government transparency, and strengthen democratic institutions. Thailand’s oldest political party the Democrats, which was the second strongest party in the last official poll in 2011, is currently on course to lose its stronghold in Bangkok, with early results putting it in fourth place with 3.28 million votes. Thailand’s heavily polarized political landscape has historically pitted the royalist, pro-establishment Democrats against those loyal to exiled former prime minister Thaksin — often culminating in deadly street protests. Leader of Democrat Party and former Prime Minister Abhisit Vejjajiva announced his resignation Sunday night following his party’s poor showing.